Eclectic electric: So is Volt an EV? A hybrid? Last week, some auto pundits and bloggers were up in arms about the Chevrolet Volt. They said General Motors Co. lied when it said the car was an electric, not a hybrid. Here are some answers. So what is the Chevrolet Volt -- a plug-in hybrid or an electric? It's a plug-in hybrid. Here's why: SAE -- formerly the Society of Automotive Engineers -- says a hybrid is a vehicle with two or more onboard energy storage systems that provide propulsion. With a gasoline tank and a propulsion battery, the Volt is a hybrid. It matters not how the energy is converted and delivered to the wheels. Last week's confusion arose in part from GM's marketing department, which wants to distinguish the Volt from the popular Toyota Prius hybrid. So it is adamant that the Volt is not a hybrid but an "extended-range electric." So will buyers of the Volt still get the $7,500 tax credit for electric vehicles? Yes. 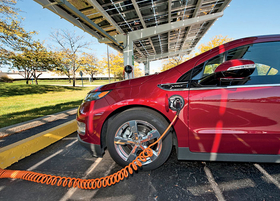 Although it's considered a hybrid by SAE, the Volt qualifies for the credit. The federal law that determines the credit simply says that vehicles with sufficiently large propulsion batteries qualify. Why did some journalists say GM lied about the Volt? Lie is a loaded word that implies willful intention to deceive. That's one step too harsh in this case. Before last week, GM said the Volt is propelled only by electricity. This description was driven, in part, by GM's desire to distinguish the car from the Prius. Doug Parks, the vehicle line executive for the Volt, said last week that GM withheld full details of how the Volt works for competitive reasons. Automakers usually dole out details about future products over time. It looks as if GM's marketing desire to call the Volt an electric trumped the separate need to describe it accurately to journalists. Last week, GM paid the price for the mixed message.